Cabins of Birch Hollow is totally committed to honoring the men and women who serve and protect us every single day, voluntarily putting themselves in harm’s way, whether overseas in the Military, or right here at home. We have honored both Active and Military guests with a Special bonus for many years, but just last year we realized 1st Responders throughout our country deserve a Special bonus as well. We had included firemen, EMTs, paramedics, and police officers in our list of 1st Responders, but we just expanded that list to include All 911 Employees as well! These folks work in the call centers, responsible for quickly connecting a distress call to the appropriate team to handle that particular situation. They are part of the 1st Responder team that provides vital service and protection to the homeland whenever a crisis arises. 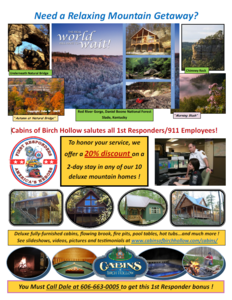 We all depend on them to be there for us every day, and Cabins of Birch Hollow wants to make a relaxing mountain getaway a little easier for these folks who deserve a break from very stressful work. To help spread the word to all these brave individuals, we created a flyer to be posted and shared at emergency centers within a day’s drive of the cabins. We want them to know that Cabins of Birch Hollow is less than a day away, and they can escape for some quiet relaxation or exciting adventures with their loved ones to this amazing hidden treasure called the Red River Gorge and Natural Bridge State Resort Park! If your family or circle of friends includes 1st Responders, please download and share this flyer with them, so they can share it with their teams and as many as possible can enjoy a mountain getaway. If printed copies on a high-quality commercial printer are needed, they can give us a call at 606-663-0005 and ask for Katy. She will be happy to print and promptly mail as many copies as needed to get the word out. Your kind gesture in sharing this bonus with 1st Responders you know will be greatly appreciated. Previous Post Our “Winter is Magical Special” is Here! Next Post Spring has Sprung in The Gorge ! !